How well does VyprVPN protect your privacy? VyprVPN is the VPN service offered by a Switzerland-registered company named Golden Frog. VPN service is primarily about protecting subscribers' online privacy and anonymity. All VPN vendors make bold claims about how well they provide security protection. In this article, we review VyprVPN on whether it indeed makes privacy their top priority. Many VPN vendors tout their no-logging policy. There are many types of information that a VPN vendor can log on its VPN servers. For this discussion, we will differentiate between connection data and activity data. Connection data includes information on how much bandwidth a subscriber uses on a server and when. Many VPN vendors keep connection logs for network planning and troubleshooting purposes. This is an acceptable industry practice because a subscriber's source IP address is usually not logged in order to avoid identification. Activity data, on the other hand, includes the subscriber's source IP address and activities on the Internet. With activity data, subscribers can be uniquely correlated with their Internet activities. These logs are locally stored on your smartphones and laptops 'for diagnostic and troubleshooting purposes and never sent to Golden Frog unless a customer chooses to send the log to Golden Frog customer support.' This is a questionable product design decision. After all, the average subscriber has no use of the information, and it poses a grave privacy risk in the event of a theft or a raid by authorities. Update: They don`t save logfiles anymore - verified by Leviathan Security Group! The VyprVPN network spans 65 countries with 700+ servers and over 200,000 IP addresses. With that many servers, how does one choose which VPN server to connect? Usually, you would choose the VPN server closest to you. But, the closest server may not always be the fastest. VyprVPN offers the Fastest Server feature on the Windows, MacOS, Android, and iOS client apps. This feature enables the client app to automatically select the fastest VPN server at connection time. Network conditions change over time. So, the fastest server when you first connect to the VPN may become slow later. VyprVPN servers are deployed in clusters. If the server you are connected to becomes congested or unavailable, your connection will be switched transparently to another server in the same cluster. Despite a VPN vendor's best effort, a VPN connection may occasionally drop. At the drop of the VPN connection, your Internet traffic is rerouted to your regular unprotected Internet connection. It could happen unsuspectingly when you are downloading a huge torrent file, or watching a sportscast from a foreign country. The industry best practice, in the event of a dropped VPN connection, is to immediately shut down all Internet connections in order to prevent leaking of your private data. This is essentially the kill switch feature. VyprVPN provides the kill switch on its Windows, MacOS and Android client apps. The popular iOS client app does not currently support this feature. VyprVPN operates its own DNS servers, a feature not shared with many of its competitors. If a VPN vendor does not provide DNS servers for its subscribers, they would rely on their Internet Service Provider (ISP) or a third-party such as Google for DNS service. This raises privacy concerns because your ISP or Google can log your DNS queries. By operating its own DNS servers, VyprVPN mitigates any DNS-related privacy concern. VyprVPN Free is not to be mistaken as the 3-day free trial which we will discuss in the next section. Rather, it lets you try out the VPN service for free on the mobile and desktop platforms, specifically, iOS, Android and Windows. To get VyprVPN Free, download the corresponding VPN client app to your device, and from there, sign up for VPN service. The iOS and Android client apps are available respectively from the Apple App Store and Google Play. The Windows desktop app can be downloaded from the VyprVPN website. You are limited to a total of 500 MB of data transfer. Only a maximum of 2 devices can be connected to the VPN at the same time. A typical scenario is to connect an Android (or iOS) smartphone and a Windows laptop to the VPN. You can upgrade to a paid plan when you reach your bandwidth limit or sooner. VyprVPN offers a 3-day free trial. A better description is that the first 3 days of a paid service are free. Both free trial and paid subscribers sign up in the same way. In particular, everyone must set up a payment method. If you don't explicitly terminate the service by the end of the 3-day period, your account will automatically be charged. During the sign-up process, you will be asked to provide your email address, your first and last name, the billing country and postal/zip code. While disclosing your email address is unavoidable, the rest of the personal information are not usually required by most VPN vendors. 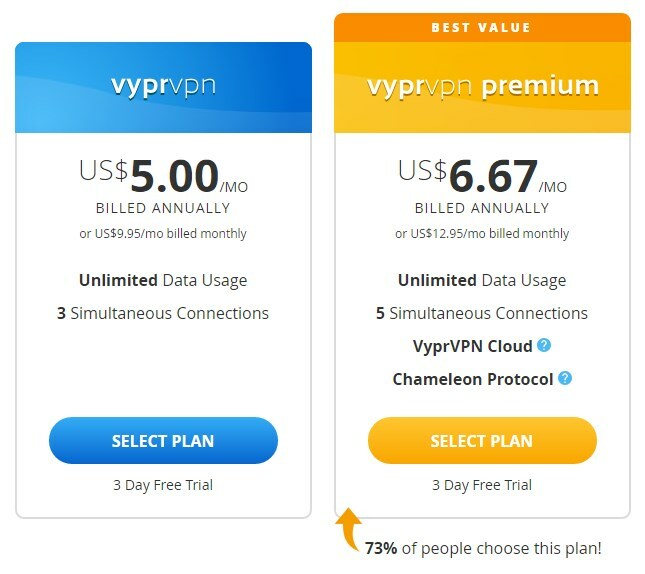 Many VPN vendors offer multiple subscription plans with the same feature set but priced differently according to the contract period. It is common to offer 1-month and 12-month plans, both with unlimited bandwidth, but the 12-month plan would cost less per month. Similarly, VyprVPN rewards subscribers with a lower monthly rate if they commit longer. The difference is that a less expensive subscription plan also has less features. In total, VyprVPN offers 3 subscription plans: Basic, Pro and Premier. The Basic plan, while being the most affordable, is the bare-bones version of VyprVPN. We do not recommend this plan because it is missing a critical security feature, namely the OpenVPN protocol. OpenVPN is arguably the most secure and also the fastest of VPN protocols today. Support for OpenVPN is only available for Pro and Premier subscribers. VyprVPN Pro can be had for $8.33 (USD) per month with a 12-month contract (more expensive for the 1-month). VyprVPN Premier, the most expensive of the 3 plans, is priced at $10 per month with a 12-month contract. The only difference between the 2 plans is that the Pro plan allows 3 devices to connect simultaneously to the VPN, 2 less than the Premier. This is a minor difference because most people can get by with only 3 simultaneous connections, for example, a smartphone, a laptop, and a desktop. If you require more than 3, you can always enable VPN on a compatible Internet router. A router counts as a single device although multiple devices can be connected to it. You can pay for the VPN service using a major credit card, PayPal, or Alipay (the Chinese equivalent of PayPal). Not supporting Bitcoin is alarming to the security-conscious subscribers. While the other payment methods require you to disclose your identity, Bitcoin as a digital currency can be circulated anonymously. Many VPN vendors have a 15 or even 30-day money-back guarantee. In contrast, VyprVPN has a strict no-refund policy. Once the free trial period expires, you cannot claim a refund. The VyprVPN service is backed by round-the-clock support via email and live chat. The VyprVPN website is also an excellent source of information with many helpful guides and tutorials. You will also find a blog full of industry news. My favorites are the online forums. You can read other people's comments about the service (or contribute your own). You can also influence the product road map by making new feature requests and voting up (or down) existing requests through a special forum. If you do decide to subscribe to VyprVPN, we recommend either the Pro or the Premier plan because of OpenVPN support. Dynamic server switching to avoid overloading of servers. Use of own DNS servers. 7x24 email and live chat support. Server-side as well as local logging. OpenVPN not available with Basic plan. Kill switch feature not available on all platforms. No refund after the expiry of the 3-day free trial.